Spray any liquid! 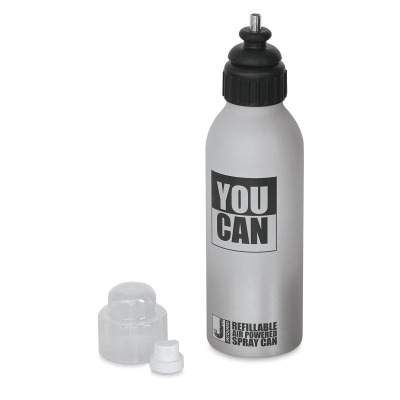 The Jacquard YouCan Refillable Air Powered Spray Can looks and feels just like a regular aerosol can. Fill it with your favorite paint, medium, or other liquid and use it over and over again. 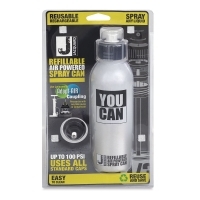 The reusable spray can is powered by compressed air. Pressurize the can with a bike pump or compressor and you're ready to spray. The eco-friendly YouCan is free of any irritating propellants. There aren't any odors or fumes, so you can spray indoors. 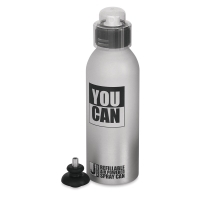 When the can is empty, don't throw it away — just refill and spray again. The Jacquard YouCan Refillable Air Powered Spray Can works with a wide variety of spray caps. Its Adapt-Air coupling can also be used to rescue leftover material from normal aerosol cans that have lost pressure. For artists 12 and up.